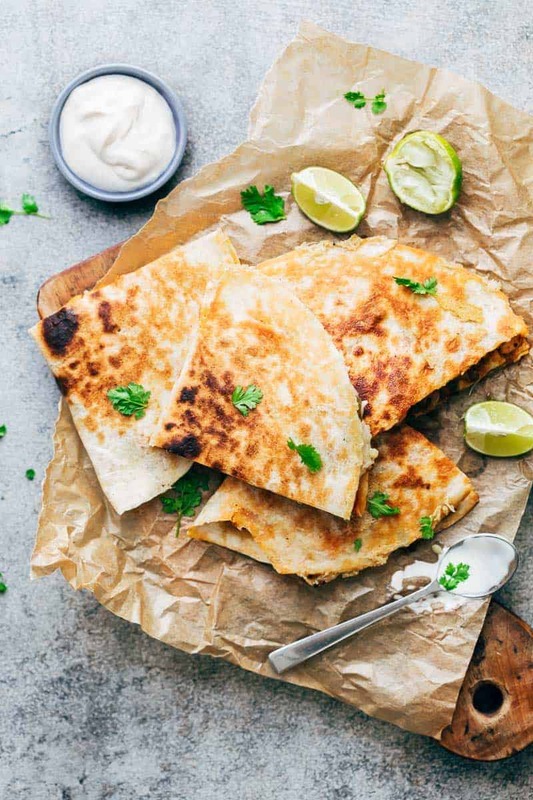 Crisp and amazing – our quesadilla game is strong, thanks to many practice sessions that went into the making of this recipe video. I’ve made quesadillas a few times and it’s our favourite way to use leftovers mostly. They are generally clean-out the fridge kind of quesadillas where I chop up veggies + protein, season them with a mexican style seasoning and stuff up a tortilla with them. These chicken fajita quesadillas are a more organized attempt at a great tasting quesadilla! This has layers of chopped up chicken fajitas, leftover mexican rice and lots and lots of cheese! Dinner in 30 minutes that disappears in 3 minutes. We really chomped these down. 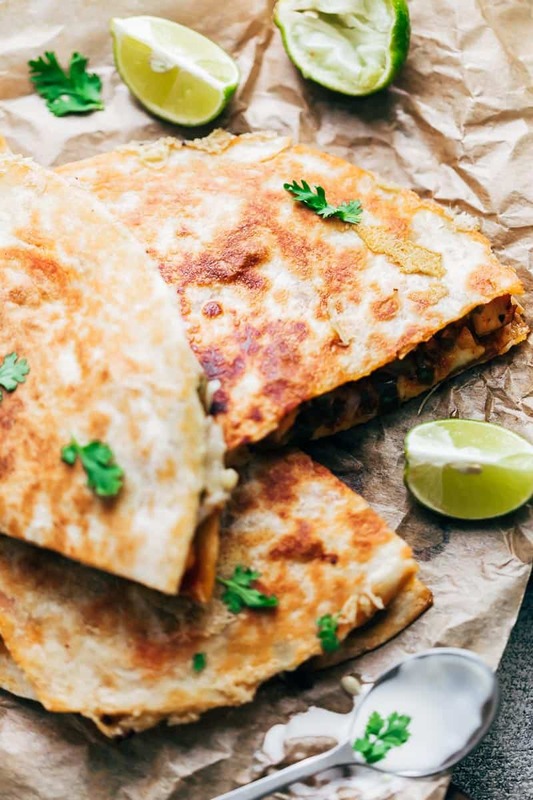 Let’s take a look at some basics for this recipe so that you guys can become quesadilla pros. The seasoning for the chicken fajitas is a mix of chilli powder, cayenne pepper, ground black pepper, cumin and salt. We add chopped garlic separately so that the flavour is nice and strong. This is the same seasoning that I’ve used in my chicken fajita meal prep bowls. 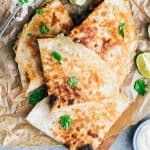 These chicken fajita quesadillas start off by cooking chicken thighs with fajita seasoning and garlic after which we add onions and bell peppers. Everything is chopped up nice and small so that when you bite into a quesadilla you don’t get a big piece of chicken or veggies that you struggle with. Once the fajita mixture is ready, a tortilla is heated on a skillet (I recommend cast iron skillets because they get the crust really crispy) and the filling is placed on one half of the tortilla. Then some mexican rice and cheese. The other half is flipped on top and you just press it all down. I like to use one tortilla versus placing another tortilla on top because this is easier to flip (though I still screwed the flipping up in the video below). I recommend chicken thighs for fajitas vs breasts simply because they don’t dry out or become stringy while cooking/reheating. The thighs are also juicier when you bite into them. When we’ve used chicken breasts in the past, and tried reheating the fajita filling, the chicken always becomes a little dry. That said, if you absolutely want to, go ahead and use chicken breasts, although I recommend cooking them whole and then chopping them up. 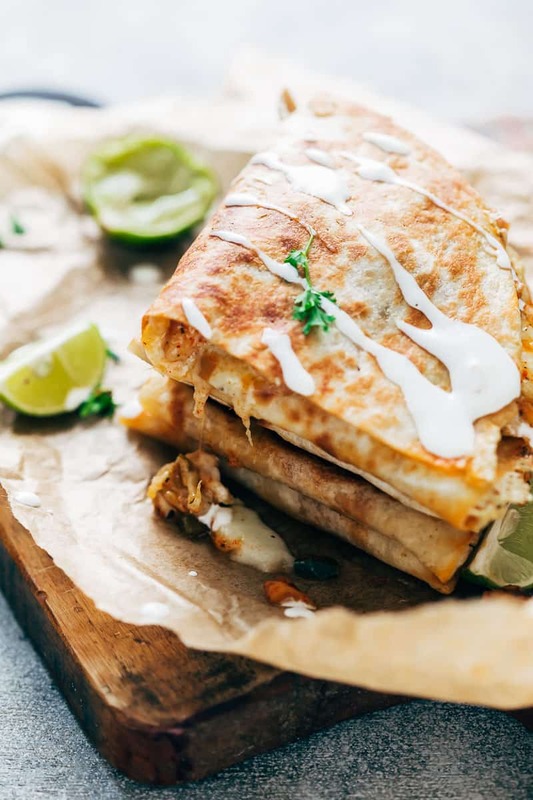 There are no rules with these chicken fajita quesadillas. You can make these vegetarian by using more veggies or beans in the filling, or if you want a different protein, use the fajita seasoning with ground beef or pork. And if you want to save even more time, use shredded pre-cooked chicken. The way I’ve tested this recipe, you need approximately 1/2 cup of filling + 1/4 cup cheese per quesadilla (two triangles). Any more than that and the filling tends to spill out. But I also like to get messy so go ahead and fill them more if you like overflowing but delicious quesadillas.